I've seen a few password change posts, but I wasn't 100% sure it was the same process, so I am asking here. We periodically have to change the passwords for a few Cache user accounts across several servers. Is there a process/script to change these passwords without having to go into the web portal on each server? Thanks so much, and I apologize if this was covered in some of the other articles that I've run across. Just looking for the best method. I loaded 2017.2 onto a windows desktop that I was going to use for testing. I need to now uninstall 2017.2 but when I do I get a ERROR saying it can not find the INSTANCE name, when there is HEALTHSHARE defined. Has anyone else had this issue? I would like to uninstall this version and start over from scratch without having to re-image my machine. How do I call IRIS, then run a few commands from it, using a Windows Batch script? I need some help with sending PDF files to printer using cache instead of using third party tools(Adobe, foxit reader, etc..). Sometime i getting access issue with the exe files. Can able to send text data to printer using below code. USE Dev Write "Test printing",! Any suggestions on sending PDF to printer? I'm new to Iris, trying to follow this guide ( https://community.intersystems.com/post/k-means-clustering-iris-dataset ) about using clustering. I've followed all instructions until showing the data. At that point, `dataFrame.show()` fails with `java.sql.SQLException: Access Denied`. I want to connect to my local terminal via Eclipse in Windows. I am able to connect to the server but not my own machine. 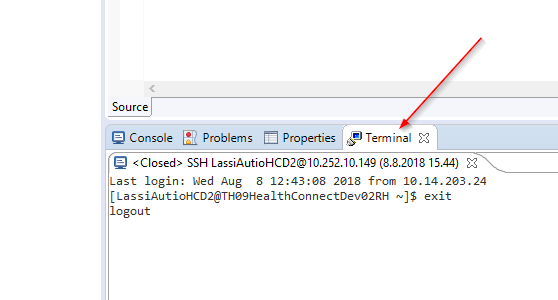 It opens from "cube icon" -> Terminal but I want to open and connect to it in Eclipse. How should I connect to it? was returning -1, indicating that the Windows command could not be issued. I need list all available Windows AD groups . I need to change the attributes of Windows Users of AD, adding and remove groups. Note: I was able to make the connection to LDAP, and I listed the groups that a user. Is it possible to create a Windows executable file from a Cache MUMPS (COS) routine, such that the routine can be run directly from Windows ? If so, could some kind soul direct me to a source of information that describes the process. I am using the free Intersystems Cache installation (CachePCkit V2017.1) on Windows 10 for my own use & personal development. My system is windows 10. How to reslove it. This 'feature' have been around for a long time, but I don't see any articles on it so I thought I would make everyone aware. A method is provided to customize the appearance of the Cache cube icon in the system tray so different instances can be visually distinguished. When csystray.exe, the Cache/Ensemble cube program, starts, it will look for files named "up.ico" and "down.ico" in the \bin directory below the instance installation directory. If these .ico files are present, csystray.exe will load the icons and display them in place of the default blue and gray Cache/Ensemble cube icons. These files should each contain a single small (16x16) icon. 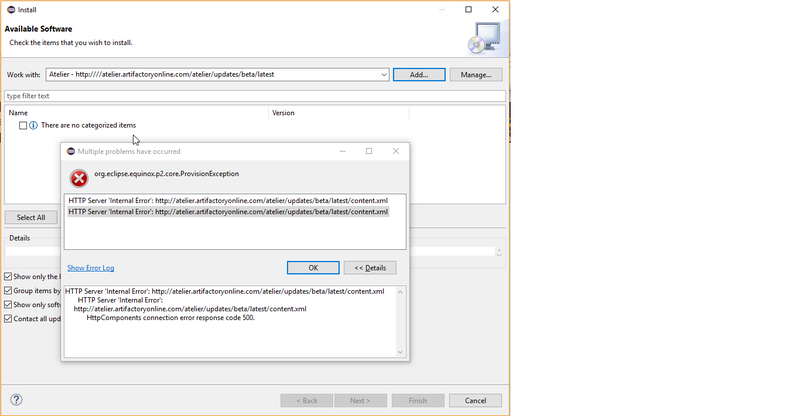 DC readers running Caché etc on Windows, configuring the Telnet service to use SSL/TLS, and using the Caché Telnet client (CTerm.exe) to make the Telnet connections may like to know that there's a fault in 2017.1 and 2017.1.1 which prevents CTerm.exe from establishing the secure connection. Workaround is to use a pre-2017.1 kit to install on your client machines (e.g. 2016.2.2), or to fetch the bin\cconnect.dll from an earlier version (I used 2016.2.2) and use it as a replacement for the 2017.1 / 2017.1.1 copy. Does calling the BIND method of %SYS.LDAP, with the username, domain and password of the user that needs to be authenticated- the right way to authenticate him/her ? Does anybody else have problems installing the Caché 2017.1 FT for Win_x64? I'm getting an error "Unable to execute the required file: The following system error has occurred: The system cannot find the file specified. (2)"
This is happening with the very latest version (build 726) and the previous one ( build 720), whereas the builds before were fine. I've uninstalled Caché to see whether it was an upgrade vs clean install problem but it makes no difference. Plain $ZF(-1) and $ZF(-2) calls from Cache Studio or Terminal have stopped launching the OS shell from Win10. cmd (Windows Command Prompt) should be launched. Is this common? I have enabled both %Developer role and a Cache CallOut privilege for all users that operate in this scenario. In all four cases, cmd (Windows Command Prompt) is not launched! I'm currently struggling with launching a routine from the command prompt using ccontrol. This receives c:\temp\ then in the routine. However, when there is a space inside the parameter it assumes that it receives a script. I can still run it using ccontrol terminal, but that then tells me the argument is invalid. 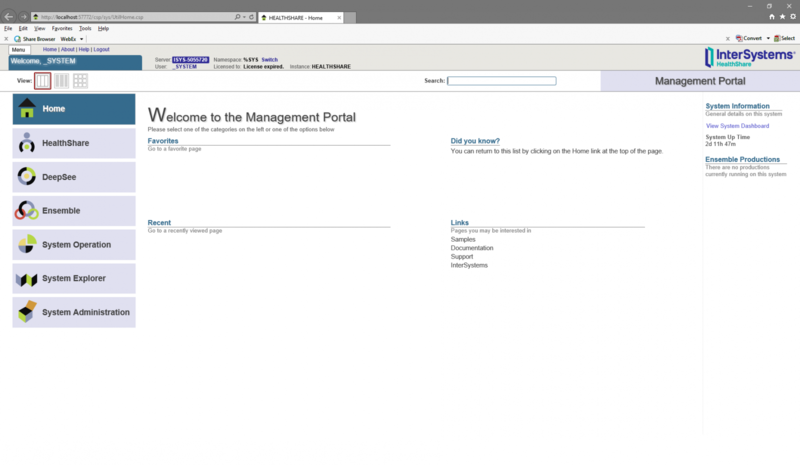 Therefore, is there something like a placeholder for whitespaces? And, is it possible to hand it the credentials? Or is there a better way to launch a routine from an external script? I could do it via a TcpClient and telnet but that's a bit clumsy and I'd prefer not to go down that route. Who does Windows think I am? When my COS code is executing in a Caché process it might want to interact with the host operating system. For the purpose of this post I'm focusing on a Windows host, but much of it applies to other host OS platforms as well. A common example of host OS interaction is when my process wants to read from or write to a file. What credentials will apply when Windows is checking whether or not to allow me access to the file? To answer that we need to consider another question. How did our process start? I am pleased to announce the next 2016.2 field test kit, 2016.2.0.605.0. Is there a recommended way to deal with the unattended reboot that happens when Windows Updates are applied? These reboots cause issues with running Ensemble produtions.